offered by the Department of Biostatistics, Bioinformatics, and Biomathematics. 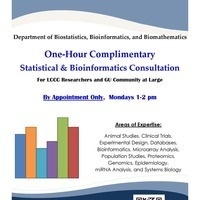 For LCCC researchers & GUMC community. Appointment ONLY, Mondays 1pm - 2pm. Animal Studies, Clinical Trials, Experimental Design, Databases, Bioinformatics, Microarray Analysis, Population Studies, Proteomics, Genomics, Epidemiology, miRNA Analysis and Systems Biology. Contact Veronica Chiu at dbbb@georgetown.edu. Appointments are assigned on a first-come, first-serve basis.